Earlier this week I shared some information on the Pamplin Historical Park Facebook page about the two military dams located on the property now owned by the Park. Due to the steam they were built on running in the opposite direction needed, and thus ponding the water between the Confederate earthworks and their picket line, they were largely ineffective. In that post I mentioned Rohoic Creek dam built by Confederates just southwest of Battery 45 on the Dimmock Line. Rohoic Creek dam was probably the largest of the several dams constructed by the Confederates as defensive measures for the Cockade City and its vital supply lines. This stream, sometimes referred to as Town Creek or Old Town Creek, runs from its headwaters on what is now Pamplin Historical Park and flows to the Appomattox River, west of the city. Yesterday, having the day off, I took the short drive over to the dam to get some photographs of the Rohoic Creek dam so I could share them here. 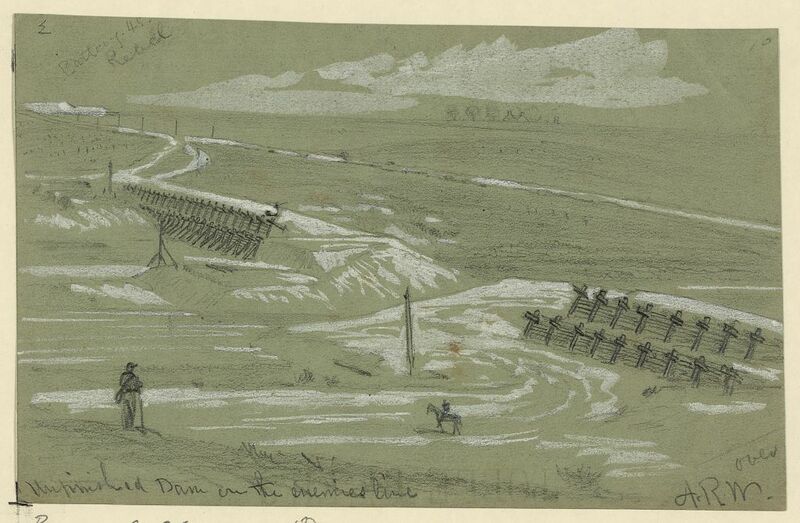 While the monument stone in the above image states that the dam was built in August 1864, historian Earl J. Hess in his book, In the Trenches at Petersburg: Field Fortifications and Defeat, contends that the dam was built after Gen. Grant's Fifth Offensive, "with most work taking place between November and December." Hess also states that Gen. Alfred Scales's North Carolina Brigade, who was stationed near that point of the line, completed the dam around the end of the month. Apparently it filled with water quickly and built up significant pressure because it gave way in January and flooded the creek valley sending a flood wall toward the Appomattox River that uprooted trees along the banks and washed away any structures in its path. Shown in the photograph above is the present-day northeast side of the dam wall looking toward Rohoic Creek. 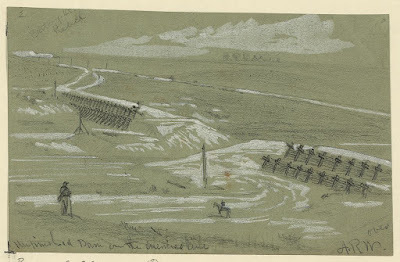 The Library of Congress website has a sketch image by artist Alfred R. Waud showing the Rohoic Creek dam undergoing repairs during the winter of 1865, after it had broke. In the image's background is Boydton Plank Road. Battery 45 is in the top left corner of the sketch. When dammed up, the creek's floodplain on the Boydton Plank Road side was inundated with water. Apparently, from the looks of the image, when Boydton Plank Road was flooded it was re-routed across the dam's top. Taken from the top of the northeast section of the dam wall, the above photograph shows the Rohoic Creek bed and period floodplain looking south toward Boydton Plank Road, which can barely be seen running horizontally through the middle of the image. The southwest section of the dam wall and Rohoic Creek are shown above. The creek flows from left to right. Building the dam required the movement of an enormous amount of earth. It is a pretty impressive feat considering the men who built it were only using hand tools. Thanks for this. 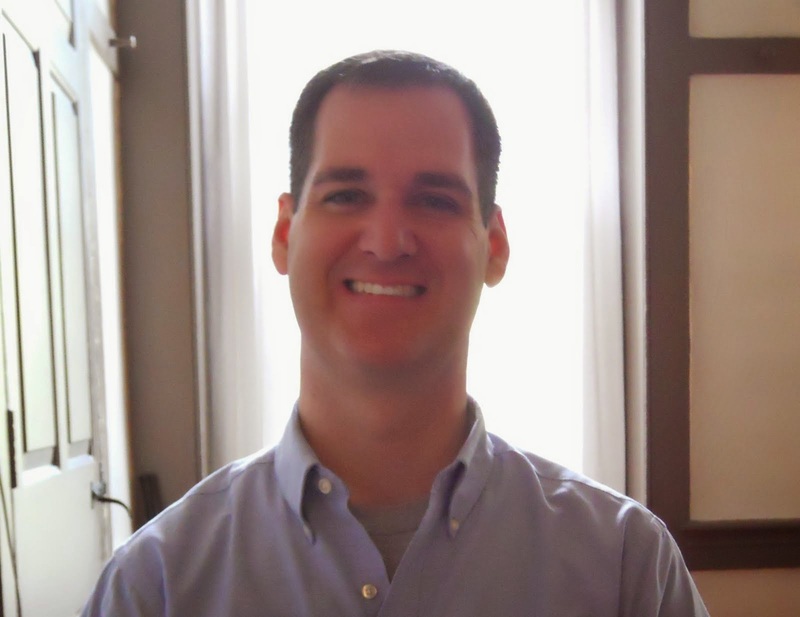 I am visiting the Battery 45 area next month. Is this site accessible without trespassing, and if so, where is the best place to access? You're welcome! As I understand it, the Battery 45 location is owned by the city of Petersburg, so visiting it would not be trespassing. However, finding a place to park your car is challenging. The best access is probably along Boydton Plank Road and either park off the road at the intersection of Dupuy Road and walk up Boydton Plank Rd., or park at the intersection of Boydton Plank Rd. and Defense Rd.